They’ve arrived. The swallows that is, all the way from South Africa to the supposedly summer climes of rural Lincolnshire, England. As I look out over the nearby lagoon at their dramatic acrobatic flight display I’ve got to admit that I’m just a little jealous. Well frankly, I wouldn’t have minded being a bird, permanently in flight, twisting and turning my way through the lower heavens towards my next snack of unsuspecting flies. The slight adjustment of wing with its resulting daredevil feats seem to shout one thing at me ‘I was born to fly, to be carried on the wind currents of my earth free world’. Yes, I’ve flown in a plane, both large and small but it’s not the same; pretty boring in fact. Best to fall asleep and wake up at the inevitable bumpy landing. No, I think the only way to get close to the swallow thing is to take up hang gliding, surely one of the craziest but most exhilarating leisure pursuits to have entered into the heart of man. If I wasn’t such a coward I might give it a go. Nothing up there but me and the wide blue heavens. The wind whirling around my little flightsuit as I hang on for grim death – well rather to avoid an extremely grim death. Just me up there and no-one to dictate to me unless an F-16 flies by with pilot thumbs urgently pointing to earth. What a life! Where will the wind carry me next? The fusion of man will and nature’s element. True Oneness. OK, so a 56-year-old Irishman like me isn’t really going to get up there. Yet my heart yearns for the freedom of flight. Why? Has something been wired into my Being by a Creator who didn’t give me wings. Is it just a Divine tease or can I fly in some way unknown to conventional wisdom? I believe so. We were created to fly, not in the space-time material world but in the invisible, but none the less real, realm of Spirit. Spirit, Breath, Wind, all descriptions of that part of the Divine than seems to permeate and overlap this world of things and stuff. An unseen Presence to the unenlightened eye but to one ‘born from above’ a heaven of God-ness granted for us to soar through, like excited angels on their day off. Many would love to fly but fearful decide to stay rooted on seemingly solid ground looking enviously up at those gliding towards the mid-day Sun. Yeshua promised to fill our beings with Spirit, the same Wind Presence that enabled Him to soar during His earthly sojourn. If ever a man flew high it was Him, close to the Father’s heart, the very reflection of Divine Love. Yet it was Spirit who carried Him there! The same Spirit that’s supposedly fear free and ready to go! Should I stay on the ground and be a good little religious boy or should I let Him carry me where He wills? Many of us, believing ourselves to be free flying, cheat by taking a flight on Church Airways, where the trusty pastor pilots have had few crashes and a safety record, second to none! How much easier to let the organization take care of my flight desires, by buckling me into my economy pew and reassuring me of my chosen destination. A few inspiring captain updates and Bob’s your uncle – flying Home without risk. What a travesty of the Spirit filled life. Me, Spirit and God’s high heaven. That sounds more like Yeshua’s take on things. Who knows, we might even bump into the odd frequent flyer up there too. 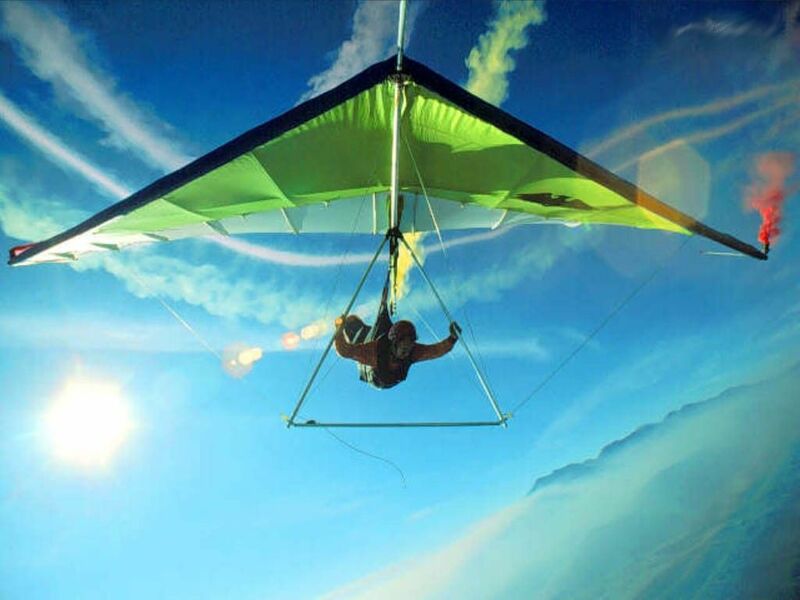 Where two or three are hang gliding there I am in the midst! Now where did I put that helmet? Then there is my favorite: Dream Flight. It hints and whispers of deep prophetic things, desires relayed from the shadows of our psyche and perhaps a response to a calling of the Higher Self who seeks to soar the the Source and Originator of the Love Song being sung over us constantly. Perhaps the birds were given as a symbol and example to us, to encourage us to fly and see things with a “bird’s eye view”. Thanks for dropping by Michael. Yes, flight within dreams is a most exhilerating experience – a feeling of being close to our original purpose and empowered by Spirit Source. Watched a hawk today, far up in the heavens, with it honed focus on the earth below. The vision of the Master! Just love this – reminds me of a friend (who may now know if it’s true) who said he believed we’d fly in heaven. Also title of an encouraging book about working with drug addicts called ‘We dance because we can’t fly’. Thanks for the perceptive comment Sheila. It could even be that spirit within us has never known separation from Spirit Breath, the fire from which it sparks. Just a thought! 🙂 it is the mind in-cased in my flesh that is always trying to break free and become light …. it does not realize how ONE it has always been with the very breath of God 😉 I don’t really know a lot of spirit lingo. I grew up in churches that thought charisma was a disease 🙂 I don’t think I am anything but oneness now though it took til just recently to begin to see it and if I saw b/f I only got a glimpse. Wonderful Sheila. It’s the sense of connection that counts not our psycho-spiritual lingo. The genie is now out of the lamp – you know that you’re not alone but part of All.